The two books of preludes and fugues in alternately major and minor keys – twenty-four in each – were not written in sequence or as a single concerted effort. They occupied Bach across most of his creative life, from his late twenties to about sixty. He completed Book I in 1722 and Book II a generation later in 1742. The significance of the title lies in Bach’s intent to prove the practicality of adopting a new system of tuning the clavier (a generic term for keyboard instruments at the time, but referring mostly to the harpsichord), namely by means of artificially dividing the scale into twelve equal semitones, hence overriding its natural acoustic divisions into unequal semitones which produced severe problems of intonation. A prelude can mean so many things that a single definition is impossible. As found in the WTC, each prelude is a free, improvisatory piece that examines from various angles a figuration, texture, melodic motif, rhythmic idea or some combination of these in a continuously unfolding musical discourse. A fugue is a somewhat more complex matter. 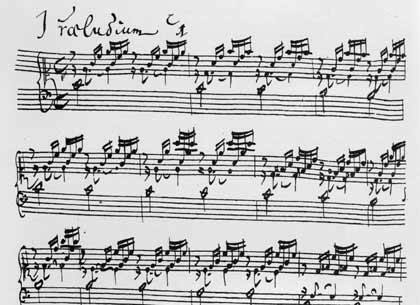 The fugue’s “subject” is announced in the opening bars in one of the fugue’s three or four voices (on rare occasions, two or even five voices are found). This subject is then stated in a second voice while the first continues with a “countersubject”. Succeeding voices are treated similarly, quickly establishing a dense contrapuntal web which continues for the duration of the fugue. Often near the end, but also at various points along the way, the composer might use the technique of “stretto,” in which the subject makes overlapping entries in each voice in quick succession. Additionally, the subject may be inverted (turned upside down), augmented (played twice or four times as slowly), or diminished (played at double or quadruple speed) at any point following its initial presentation. In contrast to the simplicity of the first prelude, the first fugue is one of the most intricate, tightly woven and masterfully constructed. There is no countersubject. Instead, Bach indulges in much stretto, using it not just at the end but also throughout the entire fugue, starting as early as the seventh bar. Only a composer (or a frustrated student) can fully appreciate just how difficult it is to fit together all the elements of a proper stretto while maintaining a continuously flowing melodic line and avoiding tedium. 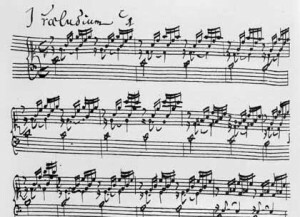 At the other end of our traversal, for the final Prelude and Fugue in B minor, we would expect Bach to produce something truly exceptional, and he does not disappoint us. The prelude moves inexorably forward like a huge musical juggernaut. In form it is unique in the First Book, with each of its two sections delineated with repeat signs (not always observed in performance) in the manner common to a movement from a suite. Also unique are the performance directions. The manuscript score contains tempo indications (Andante for the prelude, Largo for the fugue) for this pair alone. The fugue is the longest in the entire First Book. Its subject is remarkable for containing every one of the twelve pitches of the chromatic scale, thus forming a fitting conclusion to a collection of pieces whose avowed intent is to demonstrate the validity of each of the twelve pitches of the chromatic scale. Moreover, there is no denying the fugue’s extreme chromaticism that looks forward to the world of Wagner’s Tristan and Parsifal. How Bach weaves the fierce power of his subject into a continuously fascinating, 75-bar tapestry of mesmerizing force is one of the miracles of Baroque music. Playing J. S. Bach’s keyboard music on the modern piano, pianists are confronted with various fundamental questions. The answers to these are never simple. For example: what is the “correct” instrument for the Well-Tempered Clavier? The clavichord, the harpsichord, the organ, the pedal-harpsichord? Is it permitted to play Bach on an instrument that he couldn’t have known? If it isn’t, whose permission do we need to ask? What is the right tempo and character for a particular prelude or fugue and how do we find it? How wide is the dynamic range in this music and does this vary from instrument to instrument or from venue to venue? How do we phrase or articulate a certain passage or a fugal subject? Is there need for more ornamentation? For less? For none? Which edition is the best one? Each of these questions – and many more – needs to be asked and thought about. Answering them convincingly requires experience, intelligence and – to quote C.P.E.Bach – “buon gusto”, good taste. Decisions need to be made and it takes courage to say: this is the way I want to play this piece, knowing that it will not be to everyone’s liking. One of the biggest problems is the sustaining pedal, and not just in Bach. This ingenious device enables the player to raise the dampers from the strings, allowing them to vibrate freely with any notes being played. Beethoven was the first great composer who specifically asked for its application. In his c-sharp minor sonata Op.27 Nr.2 the entire first movement is to be played “senza sordini”, with raised dampers (with pedal). The effect is magical, the harmonies are washed together, creating sonorities that are truly revolutionary. It would be reasonable to assume that pianists would follow what the composer had asked for; after all Beethoven was quite a decent musician and he certainly knew what he wanted. Wishful thinking, since in fact ninety-nine per cent of them fully ignore the creator’s instructions and diligently change the pedal at every change of harmony. WHY? Because, they argue, this effect would have sounded different on Beethoven’s fortepiano than it does on its modern successor. Have these people played on Beethoven’s Broadwood? No, they certainly haven’t but they pretend to know . Well, I beg to differ because I’ve played and recorded on it. The sound, the volume and the mechanics may be different but the actual musical idea is exactly the same. A dissonance remains a dissonance, regardless of the instrument. Does this mean that we have to disregard this “crown jewel” of the instrument when playing Bach? Not necessarily. It can be used intelligently and discreetly to assist the lack of sonority, especially in venues with dry acoustics. However, let’s not underestimate the danger of damage that can be caused by indiscriminate use of the pedal. The piano is not an automobile, where the right foot is permanently on the accelerator pedal. When string players (and singers) use vibrato all the time, on every note, it’s unbearable to listen to. The pedal is to the piano as the vibrato is to string players. Both must be applied with care, control and in moderation. Clarity is essential with Bach, the purity of counterpoint and voice-leading must be self-evident, never muffled or confused. Thus a discreet use of the pedal is not forbidden as long as these rules are observed. The question remains whether it is beneficial to the music to look for easier solutions. A perfect legato on the piano is an impossibility and one can only create an illusion of achieving it. To attempt this with the hands alone is much more difficult but it’s well worth trying. Bach certainly didn’t want his music to sound easy, it’s demanding for players and listeners alike. An eminent pianist colleague of mine recently reprimanded me for my “abstinence”. His argument was that all the great pianists of the past have played Bach with lots of pedal and we must follow their example. To me this reasoning is not very convincing. The late George Malcolm, a great musician, best known as a harpsichordist, taught me to play Bach without pedal and to enjoy the delights of purity. To me, Bach’s music is not black and white; it’s full of colours. In my imagination each tonality corresponds to a colour. The WTC with its 24 preludes and fugues in all the major and minor keys provides an ideal opportunity for this fanciful fantasy. Let’s imagine that in the beginning there was innocence and therefore C-major (all white keys) is snow-white. The last piece of both books is in b-minor which is the key to death. Compare the fugue of Book 1 to the Kyrie of the b-minor mass. This has to be pitch-black. Between these two poles we have all the other colours, first the yellows, oranges and ochre (between c-minor and d-minor), all the shades of blue (E-flat major to e-minor), the greens (F-major to g-minor), pinks and reds (A-flat major to a-minor), browns (B-flat), grey (B-major) and finally black. Of course this is a very personal interpretation and each of you may have a different opinion. Nevertheless if some of us happen to believe that music is more than just a series of notes and sounds, then a little bit of fantasy is welcome. 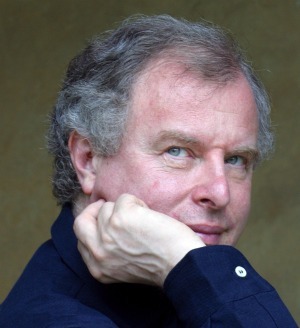 UP FIRST: On October 5 András Schiff will open the 33rd season with an all-Bach program. In fact, András was one of the first artists who launched the Vancouver Recital Society in 1981. Like so many artists who followed, he made his Canadian debut in Vancouver. CHEZ NOUS: The earliest performances were presented at the Granville Island Stage, but the Vancouver Playhouse was soon chosen as the ‘home’ for the Vancouver Recital Society. In the upcoming season we will present six afternoon performances at this downtown location. HOME AWAY FROM HOME: The VRS established its second ‘home’ soon after the opening of the Chan Centre at UBC in the spring of 1997. Now going into our 16th (!) season at this venue, we continue to present four afternoon performances along with four evening performances. Of course, Mr. Schiff adds a very special ninth performance at the Chan Centre. In total, the 2012-2013 consists of 15 performances of which 10 are scheduled on Sunday afternoons. THE PRICE IS RIGHT: we are very excited with our new, low “entry” price. For the first time it is possible to select a series of four performances for only $80 – or $20 for each performance. AH, TO BE YOUNG AGAIN: our young audience members now have greater access then ever before with our Youth Club and Ru35 programs. Throughout the season, tickets can be had for as little as $16. A POPULARITY CONTEST? : In our recent survey you ranked your favourite composers and, perhaps not surprisingly, Bach, Beethoven, Schubert and Chopin came out on top. Happily, our 2012-2013 artists will give us a lovely dose of these top-rankers. 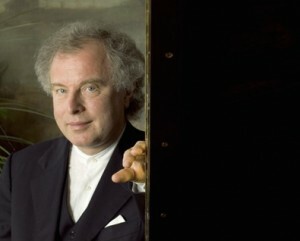 As we have seen, Bach is in the best hands with András Schiff. Schubert is well represented throughout the season, most notably by Paul Lewis whose program is dedicated to the monumental three late piano sonatas. Adding to the Schubert repertoire are Simon Trpceski and Behzod Abduraimov. Behzod also brings us the ever-popular “Appassionata” sonata by that ever-popular composer, Beethoven. Armenian cellist Narek Hakhnazaryan brings Chopin’s Introduction and Polonaise brillante, and pianist Stephen Hough includes Nocturnes on his program. 2012-2013 is shaping up to be a most exciting season. Series tickets are currently offered at exceptional prices with fantastic benefits (complimentary parking passes!). Call our office at 604-602-0363 and we’ll be happy to discuss all our subscription options. Last night I had one of the most perfect concert experiences of my life. I have been attending a conference of music managers and presenters in Budapest. I discovered that baritone Christian Gerhaher was singing an all-Schubert song recital in the Vienna Konzerthaus. It was sold out, but after 33 years in the concert presenting world, I was able to pull strings and, to my utter astonishment, I became a guest of the Konzerthaus. So, I hopped on a train and headed back to Vienna (where I’d been just the week before) to hear the performance. The distance between Vienna and Budapest seems similar to the distance between Vancouver and Seattle. Except that, of course, one just sails through borders from one country to the next. The Konzerthaus was packed to overflowing. There were 750 seats filled in the hall with an additional 50 seats on stage. I know this because I asked the Intendant of the Konzerthaus. I also enquired about their wonderful piano and he told me that they select and rent a new Steinway from the factory every two years. I am guilty of over-using the word “extraordinary”, but there is simply no other word to describe Gerhaher’s voice (or voices, as he seems to have so many of them). He inhabits the text and the music he is singing. He simply delivered what Schubert intended when he wrote the songs. Nothing more and nothing less. His regular pianist is Gerold Huber and the two of them together are as one. Right down to the tiniest nuance. 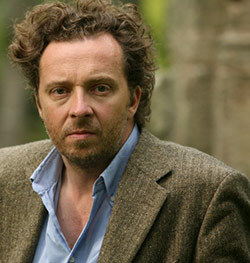 I can understand why Andras Schiff has chosen to invite Gerhaher to Carnegie Hall for his “Perspectives” Series. And of course, we, at the VRS are the beneficiaries of this collaboration. We jumped at the opportunity when we heard about it. If you are a serious, discerning music lover you must not miss the Gerhaher/Schiff performance at the Chan on May 14. Don’t expect a larger than life personality like Bryn Terfel (nothing wrong with him!) but expect the most perfect delivery of song you will experience for many, many years to come. It is both deeply gratifying and humbling at the same time. Leila (en route from Vienna to Budapest). An die ferne Geliebte, composed in 1816, stands proudly at the beginning of Christian Gerhaher’s recital as the first important song cycle from any composer, that is, a series of songs in which the constituent numbers are linked together by a theme or narrative of some sort to form a cohesive whole. The six songs of An die ferne Geliebte (To the Distant Beloved) are set to poems by a minor poet named Alois Jeitteles (1794-1858). A solitary lover seated on a hillside gazes into the distance and longs for the object of his affection. The lover’s thoughts turn to blue mountains (the second song), a brook (the third), clouds (the fourth) and the glories of springtime in May (the fifth) as he thinks of love filtered through these images of pure, unspoiled nature. The final song brings the listener full cycle, with passages of both text and music from the opening stanza returning for a fulfilling close. The songs are heard without breaks, and piano transitions link some of them. The cycle is further unified by a tonal scheme centered around E-flat major. “Adelaide,” which closes the program, was Beethoven’s first important song and dates from 1795 or 1796, about the time he was writing his first piano trios and piano sonatas. The text is by Friedrich von Matthisson (1761-1831), a much admired German poet in his day. The song is an expansive, impassioned outpouring of emotion as a man wanders about a garden and sees in his beloved Adelaide as a manifestation of the beauties of nature. Schumann composed more than half of his total song output in a single year, 1840. His love affair with Clara Wieck, who was to become his wife in August, provided fertile soil for serious attention to love lyrics. Concurrently, Schumann was beginning to recognize that the larger musical forms (symphony, sonata, string quartet) were not developing in the direction he had expected, and he was prepared to look elsewhere for the full flowering of romantic music. This “elsewhere” became the Lied (song in German). Furthermore, Schumann recognized that the piano could play a highly significant role to play in vocal music – not mere accompaniment, but an equal partner. Schumann composed Dichterliebe (Poet’s Love) in the space of about a week in May. In these sixteen songs, Schumann perfectly captures the psychological atmosphere of each poem. The piano writing, as in Schubert, is of great importance in defining the mood of each song. In Schumann, these moods are often carried to their greatest expressive heights in the piano postludes. All but two of the Dichterliebe songs end with postludes, some of them nearly half the length of the song itself. Another remarkable aspect of these songs is the vocal declamation. The music, with few exceptions, is perfectly welded to the words of the text with regard to metre, observation of punctuation and emphasis on the right word or syllable. In the opening song, beautiful weather, flowers and birds are all part of the poet’s blissful reverie on love. But this love affair is doomed from the beginning, and the cycle traces a progression of regret, pleading, reconciliation and forgiveness. By the final song, the poet is so disconsolate that he prepares to drown his love, his sorrows and his dreams in a coffin in the deep sea. The nine songs of 98a are all settings of lyric poems drawn from Goethe’s novel Wilhelm Meisters Lehrjahre (Wilhelm Meister’s Apprenticeship, 1821/1829). Schumann undertook these settings in 1849, the centenary of Goethe’s birth. Of the nine songs, four are sung by the mysterious waif Mignon, one by the promiscuous actress Philene and four (the even-numbered ones) by the Harper, an itinerant musician and a strange, confused, half-crazy, tragic figure who turns out to be Mignon’s father (the mother was the Harper’s sister), though neither character learns this traumatizing fact until late in the novel. One can surmise already that the story is filled with repression, frustration, loneliness, bitterness, withdrawal and skeletons in the closet. So too are the Harper’s songs, aside from the opening Ballad, which he sings “with free, declamatory expression” (as Schumann marked in the score) before a royal gathering. Not until 1794-95, during his second London visit, did Haydn return to song-writing. Again, he produced twelve (this time two sets of six each, published in 1797). These are the English Canzonettas. Here the writing is more chromatic, there is more ornamentation, and the emotional range is greater. “The Wanderer,” for example, is a gloomy but beautifully etched setting of an Anne Hunter poem, with the image of wandering unmistakably portrayed in the piano. “Content” is the only one of the five Haydn songs on this program in a major key and the only one not concerned with loss, despair, death or the afterlife. “The Spirit’s Song,” is a single, independent number Haydn wrote to another text by his London friend Anne Hunter. Stark in tone, dark in color, its text concerned with lonely ghosts, “The Spirit’s Song” nearly takes on the feeling of a dramatic recitative from an opera. Yesterday I watched a video on the VRS YouTube channel featuring pianist Shai Wosner playing the concluding portion of Schumann’s “Carnaval”. I enjoyed it very much. As the video concluded, another video on the YouTube sidebar caught my eye: András Schiff playing the Andantino from Schubert’s Sonata in A Major, D959. I clicked on it and was transfixed and transported by the majesty and sheer magic of his playing. That video, in turn, led to another, much earlier performance of András playing the Goldberg Variations of Bach. Again, a performance so compelling that I had to immerse myself in it to the end. If you have a moment, go to the Vancouver Recital Society YouTube channel, click on the András Schiff playlist, sit back and enjoy! I have a confession here. Along with Murray Perahia, András Schiff has been right up there on my list of most special pianists. There is something about the way that András sits, upright, and almost motionless at the keyboard as he weaves his spell. How incredibly lucky we are to be hearing him on May 14 at the Chan Centre with the equally remarkable baritone, Christian Gerhaher, and again at the Chan Centre on October 5 for the opening concert of our 12-13 Season, playing Book 1 of Bach’s “Well Tempered Klavier”. These will be concerts to linger in the memory for a lifetime.